The manner in which the state government has created a new department by combining the Directorate of Biotechnology, the Department of Pollution Control, the environmental planning unit and the partial merger of the State Council for Science, Technology and Environment, has raised many eyebrows. Telephone system in most of the part of Trans-Giri area of Sirmaur district has almost collapsed. In most parts of the area, telephones are dead due to alleged carelessness of departmental officials, while cable thieves have increased the woes of residents. In a bid to provide a well-paid market to the recently revived Kangra School of Painting, the district administration has made efforts to show-case certain paintings in a private art gallery at Los Angeles in the United States in June, this year. Senior leaders of both the BJP and the Congress will meet soon to shortlist names of the candidates to be fielded from the 25 wards in the Shimla Municipal Corporation (MC) elections to be held on May 23. Threatening to launch a stir if their land was forcibly acquired by the government, the farmers of Gurumajra and Chenalmajra villages in Nalagarh subdivision have protested against the move. The Himalayan ski village project being set-up near Manali in Kullu district by the Ford company looks forward to begin its operations by next year. Some transporters trespassed office of a newspaper during night hours and caused damage to the property and threatened mediapersons of dire consequences. The Himachal Pradesh High Court has issued notices to the state government and the HP School Education Board in connection with non-declaration of merit list of top 10 students by the education board while declaring the result of class XII (science) examination. A married woman allegedly committed suicide by hanging herself from a ceiling fan at her residence in Thehru village of Jawali sub-division in Kangra district, last night. Local residents have stepped up their demand to shift the Dagshai police chowki to the town. It is illogical to keep the chowki at Dagshai, said the residents. In some cases the police intervention was required timely, but that could not be possible with the chowki situated at quite a good distance from the area, they added. Once again the students of Adarsh Vidya Niketan Public Senior Secondary School, Nahan, have repeated history by securing a place in the merit list of Himachal Pradesh and have secured the top three positions in the Himachal Pradesh School Board 10th class results, which were declared yesterday. A group of local youths allegedly ransacked a filling station at Raja Ka Talab in this subdivision and thrashed its staff on the intervening night of April 24 and 25. It has not only raised several legal issues but also created a messy situation that will affect the functioning of the merged units. A line department like the one created has no role in the implementation of the Environment Protection Act under which powers are vested with the Centre, which has delegated some of these to the state government. As such, these powers could not be further delegated by the state government. Similarly, the government had limited powers under the Air (prevention and control of pollution) Act and Water (prevention and control of pollution ) Act. All functional powers are vested with the board. Further, under the Municipal Solid Waste (management and handling) Rules, the power of enforcement is with the Pollution Control Board and if the municipal bodies fail to comply, it is the responsibility of the deputy commissioner concerned and finally the secretary, urban development, to ensure compliance. Not only the new department has been made the nodal agency for environmental clearance and considering the validity of the environment management plan (EMP), the necessary powers rest with the Centre and the state-level Environment Impact Assessment Authority. However, in the notification vide which the new department has been created, all these functions have been assigned to it. In such a "messy" situation, inter-departmental conflicts will be unavoidable and various government agencies will not be in a position to discharge their functions smoothly and effectively. Worse, throwing all rules and regulations to winds, employees and officers, irrespective of the fact whether they are on deputation, contract or secondment, were absorbed in the new department instantly. Insiders point out that the main objective of creating the new department was to accommodate certain favoured junior officers who were either on secondment or appointed through the backdoor. In the entire exercise, the State Council for Science, Technology and Environment has been the worst affected. As many as 21 out of the total 28 posts (class III and above), three-fourths of the office space, all vehicles and other amenities have been transferred from the council to the new department. The council has been reduced to a non-entity and it will not be in a position to discharge its responsibilities without basic facilities. The Centre grants funds to the council and if it fails to carry out its functions, the flow of funds will be affected. However, principal secretary J.P. Negi, said the internal exercise to sort out things in the new department was on and all issues would be taken care of. Around twentyfour cable-theft incidents had been reported in the district last year. In most cases, the theft incidents had gone unsolved. People alleged that the BSNL was not paying any heed to restart services in the areas where cable thefts had taken place. Telephone connections were dead in more than eighteen villages of three gram panchayats which include Shamra, Bhutli Manal and Chokar of the Renuka area. The area falls under Pidia Dhar telephone exchange. People of these villages individually and through the resolutions passed by their respective panchayats had sent several representations to the officials of the BSNL, including GM Solan, in the past three months. Hundreds of telephones have been dead since January 8. Trans-Giri area comprises more than 110 gram panchyats, and telephones are the life lines of the people here. Residents further charged that most of telephone exchanges in the area were handled by employees of the BSNL, who had little technical knowledge and were always dependent on technical persons from the subdivisional office to remove snag in the exchange. BSNL sources on the condition of unanimity said the department was running short of staff. One person was handling more than one telephone exchange in many areas especially in Trans-Giri track. The sources said number of theft cases of telephone cables was high. To top it all, in most cases the police did not register FIR on the information given by the BSNL. The residents said for the past three months they were depositing their telephone bills raised by the department against their dead telephones. Those who refused to deposit the bills were facing disconnection orders. Solan BSNL general manager said he would take a report from the DET Paonta in this regard and look in to the matter. He admitted that cable thieves had played havoc with the telephone system in the area. Showing the beauty of the natural surroundings in the hills, the work of art has a natural mirror in paintings of the ‘bara masa’-the change of the seasons. These paintings have been prepared by Mukesh Dhiman and Dhani Ram with natural colours on traditional ‘siyalkoti’ paper that was used in earlier times to maintain accounts ledger. “Two sheets of paper are joined together using an adhesive prepared by mixing a chemical locally known as neela thotha with araroth powder”, said Dhani Ram, who is striving hard to keep the Kangra School of Art alive along with few of his colleagues. 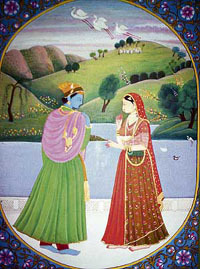 They have learnt this art from Chandu Lal Raina who was the last known artist of the Kangra School of Painting. At one time, the paintings were confined only to palaces of kings, their ministers and temples but now these paintings are also available to the art lovers on demand at the Kangra museum in Dharamsala. However, to give a further boost to the art, NRI Dr Akshai Runchal is lending a helping hand to the district administration to organise an art exhibition in a private art gallery at Los Angeles. Kangra DM Bharat Khera said the effort would definitely take the miniature paintings of Kangra to the art lovers outside the country. He said that the artists have been asked to prepare few sets of Kangra paintings so that they could be kept ready for display in the exhibitions. “We are also planning to exhibit these paintings at various locations in the country in the near future”, said the DM. A series of miniature paintings based on Radha-Krishan legends and other gods and goddesses, besides, a series of paintings based on the famous narratives in Jaidev's epic poem 'Geet Govind' are also being prepared by the local artists. The existing paintings available here in the Kangra museum depicts ideas and values that guided life in society. “Miniatures are steeped in religious faith as they depict puranic tales and stories from Ramayana and Mahabharta in minute detail”, Mukesh Dhiman said. The nine-member committee constituted by the BJP specifically for the elections will be meeting here on April 28 to chalk out the party strategy. The committee headed by former state BJP chief and MP Suresh Chandel will also screen the names from over 250 applications that have been received so far. With April 27 being the last date for applying for the party ticket, the Congress is also receiving applications from those keen to contest. The screening committee headed by IPH minister Kaul Singh Thakur is likely to select the candidates by April 30. Meanwhile, the parties are busy preparing their election manifestos. Revenue minister Sat Mahajan is heading the election manifesto committee along with other senior leaders. The BJP election manifesto committee is headed by state BJP treasurer Ashok Sood. In fact, the BJP has taken feedback from all party workers right at the booth level. “The manifesto will be based on the feedback that the party workers have given on a special performa that had been printed by the party,” said Mr Madan Sharma, president of the Shimla BJP mandal. With May 1, 3 and 4 being the dates for filing of nominations, the two parties are likely to finalise the names by April 30. The Himachal All Employees Joint Action Committee will support the political party that promises to raise the capital allowance to Rs 500 per month. Addressing a press conference here today, chairman of the committee Gopal Das Verma said the committee would oppose the Congress in the Shimla MC election and the Hamirpur byelection as the Virbhadra Singh government had not accepted demands of the employees. The capital allowance had been increased to just Rs 175 per month and no additional financial benefits granted to the employees, he said. He alleged the government was victimising employee leaders who raised voice against it and showering undue benefits on those toeing its line. The farmers led by pradhan Eshwar Singh Thakur, Yograj Bhatia, Sham Lal, Daya Ram and others opposed the move and said it was unfair to dislodge them from their dwellings to set up industries. The government has already issued notices under Section 4 of the HP Land Acquisition Act and the process to acquire land was underway. Eshwar Singh while criticising the move said the government should have taken the villagers into confidence before taking such a step. The move is slated to affect a population of at least 20,000 persons from Gurumajra, Chenalmajra, Manakpur, Shahpur and Lodhi Majra villages. Agriculture is the primary activity of the people residing in the area. With as many as 20 tubewells, the land tilled by farmers is fertile where successive crops of maize, wheat, etc., are raised. The irate villagers have now sent a resolution to the government to either stop the move or face agitation. The villagers rued that the acquisition would render the entire population in the five villages landless as the government had come up with no rehabilitation package. Faced with a threat to their livelihood, the irate farmers have decided to oppose the move tooth and nail. They further lamented that even if they gave in to the government move, they would be paid a paltry sum of Rs 15 lakh per bighas which was an inadequate amount. Though the government was going to make profits by selling land at exorbitant rates to the investors they would receive a meagre amount only. Quoting the example of nearby places where the land had been acquired at prices much lesser than the market rate the villagers said it amounted to government’s high-handedness. The Himalayan ski village project being set-up near Manali in Kullu district by the Ford company looks forward to begin its operations by next year. Sources in the Tourism Department said the company authorities had selected as many as 40 local youngsters who would be leaving for Finland next month for an advanced training as ski instructors. After training, they will be employed in the company on regular basis. These youngsters have already been given a three-month basic training at Manali, but their skills need to be honed as per the international professional standards. So they are being sent to Finland for an advanced training. In Finland, they will be trained for one month by world class instructors with the best possible equipments. Apart from this, the company has also planned to provide training to the local people in the fields of environment protection, catering, hospitality, forestry, gardening and emergency services like mountain rescue etc. The company had made a commitment with the state government that it would help in all possible ways to bring prosperity to the villages falling in the vicinity of their resort. Members of the Sundernagar Press Club, the Press Balh Valley Press Club and the Mandi Press Club have condemned the action of transporters and demanded action against them. A tipper which was loaded with clay met with an accident near BBMB reservoir last night. About 90 tippers are engaged for the transportation of clay from Nolukha village near here to be used in the construction of the 800-MW Kol Dam Project. As per specifications, a tipper can carry only 15 tonnes of clay. But the transporters are carrying more than 25 tonnes of clay due to which many tippers meet with accident. Last night, mediapersons covered the accident and took photographs. In the process some transporters abused them and manhandled them. In the meantime, some transporters entered the office of Amar Ujjala and snatched news items, damaged the office and threatened mediapersons of dire consequences. In spite of all efforts, press was not allowed to file the news item. The mater was then reported to the police and it has registered a case under Sections 452 and 506 of the IPC against Dharmeder Gupta, Mohinder Parmar and Suresh Thakur on the complaint of Balwinder Sodhi. No arrest has been made so far. A Division Bench of Mr Justice Deepak Gupta and Mr Justice Surinder Singh further directed the respondents to file their replies by May 10. The petitioner has alleged that instead of releasing the usual merit list of top 10 students, the board released the names of only top five students. He has further alleged that the students and parents are feeling dejected as they have been preparing their wards throughout the year with an aim to seeing their names among the top 10 students. Sources in the police revealed that the deceased woman identified as Reeta Devi was married to Rashpal Singh of the same village in 2003. Her sister was also married to a cousin of Rashpal Singh. The marital relations of her sister were not cordial with her husband’s cousin due to which Reeta was depressed for quite some time. She was often held responsible for getting her sister married to her brother-in-law and spoiling his life. Recently, her sister was divorced by her husband which further aggravated the mental situation of Reeta due to which she committed suicide. A case has been registered. Local residents have stepped up their demand to shift the Dagshai police chowki to the town. It is illogical to keep the chowki at Dagshai, said the residents. In some cases the police intervention was required timely, but that could not be possible with the chowki situated at quite a good distance from the area, they added. Sources in the police said due to the location of a helipad at Dagshai, the demand of the residents had been ignored. The helipad is used by VIPs and Army personnel, they added. The district police had planned to set up a police post in town a few years ago. The chowki has been functional in an old building at since the late 19th century. Over the years, the area has become a sleepy cantonment with not many commercial activities. The chowki caters to around 100 villages. For most of the villages, Kumarhatti is the central point. The bus service is the only means of transportation to reach Dagshai. In case of an emergency, one has to either trudge 3 km upstream or pay the exorbitant taxi fare to reach the police chowki. The odd location of the chowki has further emboldened anti-social elements. Even for chowki police personnel it is difficult to maintain law and order while being stationed at an isolated hilltop. The Kumarhatti panchayat has filed many representations with the authorities concerned, seeking shifting of the chowki, but to no avail. Once again the students of Adarsh Vidya Niketan Public Senior Secondary School (AVN), Nahan, have repeated history by securing a place in the merit list of Himachal Pradesh and have secured the top three positions in the Himachal Pradesh School Board 10th class results, which were declared yesterday. In a function organised at the school, K.K. Chandola, principal, congratulated the students, staff and parents for this achievement. He said Deep Shikha Bhatnagar of the school had brought laurels for Sirmaur district by securing a place in the first 20 students of the state. A woman has allegedly killed for dowry at Bhatian Saner village near here today. According to a complaint filed with the police by her mother, Kiran was found dead in her in-laws home. She hailed from Thera village and got married to Surjeet two years ago. Surjeet allegedly used to harass her wife for not bringing more dowry. Surjeet called up her mother-in-law this morning saying that Kiran was not well. The mother rushed to her daughter’s home, only to find her dead in a room. The mother has alleged that Surjit killed her daughter. A case has been registered.